Being a shorter person (5' 4"), I need a step ladder in the house for reaching things on the shelves in the kitchen and closets, as well as for changing light bulbs and doing household projects. We had a steel framed 2-step step ladder which worked well, then I found this ultra-light aluminum step ladder at Home Depot which quickly became my go to step ladder since it's so easy to use and move around. 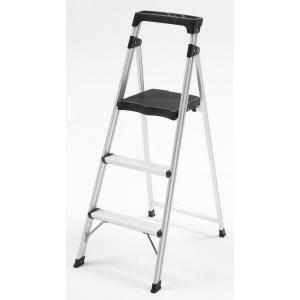 This step ladder weighs only five pounds while steel framed ones of this size often weigh twice as much. It opens and closes easily, has slip resistant steps (groves in the steps), and the oversized platform top step provides a stable standing area. While collapsed this 2-step step ladder is 42 inches tall and 19 inches wide (bottom side). 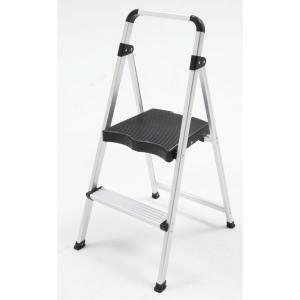 While open and in standing position, the platform top step is 21 inches above the ground. I use this step ladder for almost everything, except for changing light bulbs on the ceiling and for some household projects that require more height. So we also bought the ultra-light 3-step step ladder (same brand/manufacturer). It has a similar design including an oversized platform top step, but also has a tool organizer at the top. The tool organizer is about 14 inches long by 4 inches wide, divided into three sections for small items like tape measure, nails, screws, etc.. It also has three holes in the right section where hammers and screw drivers can be kept. This step ladder weighs about 13 lbs, still fairly light for a step ladder of this size. While collapsed this 3-step step ladder is 55 inches long and 20 inches wide (bottom side). While open and in standing position, the platform top step is 34 inches above the ground. One thing that helps is just how light the step ladder is. Tina knows it's less effort for her to use to 2-step than to get me to grab whatever it is she needs.